Available from March 2019 with increased standard specification for UK customers, the MINI brand’s most powerful Hatch and Convertible* models return with a more distinctive presence than ever. The MINI John Cooper Works Hatch (consumption: 40.9 to 40.9 mpg with a 6-speed manual transmission, from 45.6 to 46.3 mpg with 8-speed Steptronic transmission; CO2 emissions combined: 158 - 157 g / km with a 6-speed manual transmission, 142 - 140 g / km with 8-speed Steptronic transmission) and the MINI John Cooper Works Convertible* (consumption: 39.8 to 40.4 mpg with 6- manual transmission, from 43.5 to 44.1 mpg with 8-speed Steptronic transmission; CO2 emissions combined: 162-161 g / km with a 6-speed manual transmission, 148-145 g / km with 8-speed Steptronic transmission) are both equipped with the brand’s potent 2.0-litre 231 hp four-cylinder engine with MINI Twin Turbo Power technology. Fitted with the standard 6-speed manual gearbox, the MINI John Cooper Works Hatch accelerates from zero to 62 mph in just 6.3 seconds. The MINI John Cooper Works Convertible* accelerates from a standstill in 6.6 seconds. 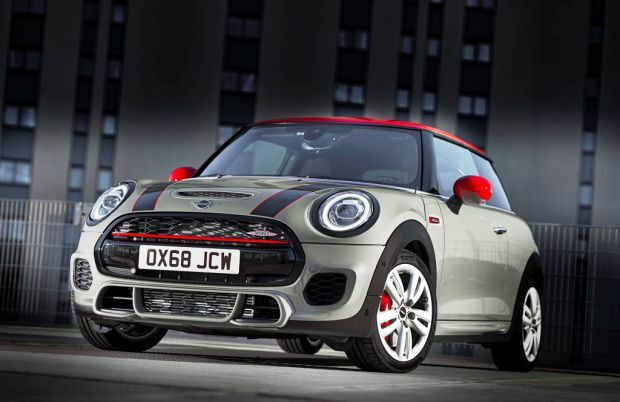 An 8-speed Steptronic sports transmission is an option on both John Cooper Works models. MINI John Cooper Works Hatch and MINI John Cooper Works Convertible* offer distinct styling thanks to a number of upgrades over and above other models in the range. Standard specification includes Sport suspension with 17-inch John Cooper Works alloy wheels, sports braking system and John Cooper Works Aerodynamic Kit. MINI has further enhanced it’s offering from March 2019 for UK customers, with John Cooper Works Hatch and Convertible* also benefiting from Piano Black exterior and interior trim, Dinamica Leather John Cooper Works Bucket Seats and 17” Track Spoke Alloy Wheels in Black as part of the standard specification. As with every MINI Hatch and Convertible* model on sale in the UK, John Cooper Works models also enjoy standard-fit front and rear LED lights, automatic headlights with rain sensors, MINI Excitement Pack including ambient interior lighting, exterior MINI Logo projection and much more. The MINI John Cooper Works Hatch and MINI John Cooper Works Convertible* are available to order at MINI retailers nationwide from 18th January 2019. * All MINI Convertibles are currently assembled in Holland, due to to production capacity limitations at Plant Oxford.